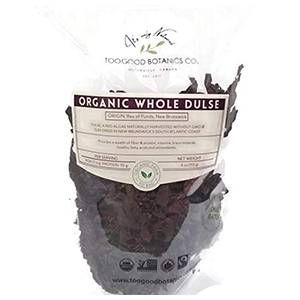 Dulse (Palmaria palmata) is a type of seaweed that grows primarily on the Northern Pacific and Atlantic coastlines, including Iceland, Canada and regions of Ireland where it has been used as a food and medicine for centuries. Palmaria palmata has been historically harvested in these regions as a wild sourced nutriment and natural remedy for preventing scurvy, malnutrition and goiter as well as improving other thyroid functions. It doesn’t require cooking, like most seaweeds, and can be eaten dried as a delicious snack food, prepared in recipes or enjoyed freshly harvested, if you happen to live by clean ocean waters. Often considered one of the best tasting varieties, it is a soft, chewy more palatable seaweed for those new to the world of sea vegetables and has a mild smoky flavor. Because of this, it has become a top seaweed of choice for many health enthusiasts looking to get some of the nutritional benefits that seaweeds can provide. 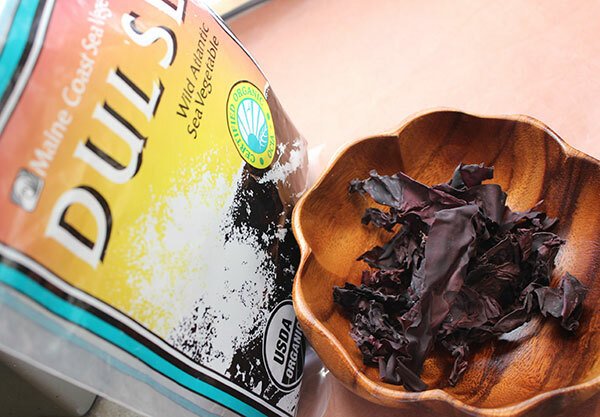 Unlike, some of the other variations, both nori and dulse can be consumed without the need for soaking or heating because their blades are fairly thin compared to kombu, hijiki, irish moss or sea palm. 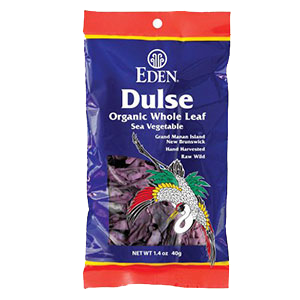 Dulse contains Vit. C and the carotenoid antioxidants, like alpha-carotene, beta-carotene, lutein and zeaxanthin, all of which are known to be good for healthy eyesight, reducing free radical damage and decreasing the risk of some chronic diseases. Containing a much higher ratio of dietary minerals than land plants, consuming sea vegetables like Palmaria palmata helps to provide more essential mineral-rich nutrients to the body in an easily digested whole food format. 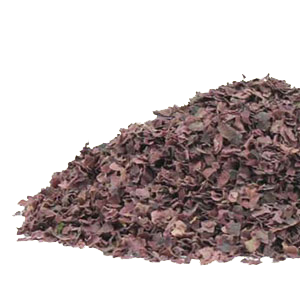 Dulse is also abundant in complex polysaccharides or long chain sugars. These dietary glyconutrients are helpful for building immune health, nourishing the skin, soothing inflammation and detoxifying the body. 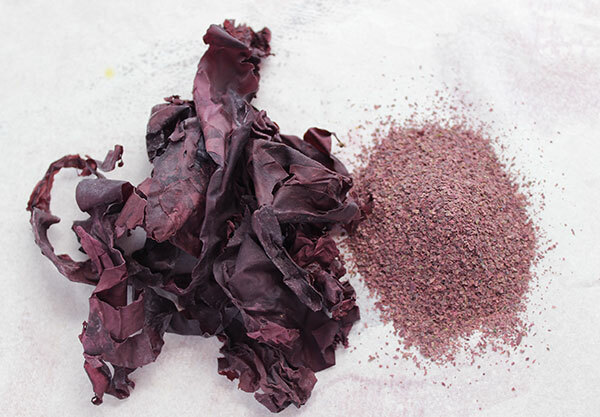 Dulse is a reddish purple marine macroalgae that is scientifically classified as a red seaweed. It typically grows off rocky shores in northern latitudes with colder temperatures that are more conductive to its growth and life cycle. All seaweeds need adequate sunlight for the process of photosynthesis and is the reason they normally attach to rocks growing in more shallow coastal marine environments. The blades or fronds of Palmaria palmata are shorter in length than kelp and are usually divided into segments, ranging up to 20 in (50 cm) long. 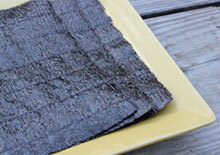 There are many dulse look-a-likes, most having thicker blades or a rough bumby texture. Most all seaweeds are edible to humans, but some are less appetizing than others. It is always good for beginners to have a seaweed identification guide handy so you know exactly what you are harvesting. For those of you living by clean Northern Atlantic or Pacific coastal waters, Palmaria palmata can be wild harvested for FREE in the early summer and fall seasons. Seaweeds are gathered during low tide when the tide pools are more accessible to seaweed growth. It is important to watch out for small shells or sea life that tend to be wrapped up in the leafy overlapping blades. 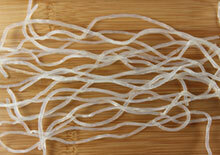 This can be done by rinsing it in seawater a few times before collecting and preparing it to sun dry. 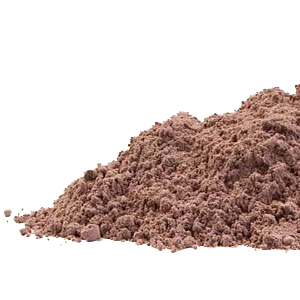 Palmaria palmata contains all the dietary minerals, but is particularly high in iodine, iron and potassium, in addition to being a good source of manganese, sodium, calcium and zinc. In the 2011 article entitled "Marine Bioactives as Functional Food Ingredients: Potential to Reduce the Incidence of Chronic Diseases" it states that, "Seaweeds also contain an incomparable wealth of minerals and trace elements which are attributed to their capacity to retain inorganic marine substances due to the characteristics of their cell surface polysaccharides. 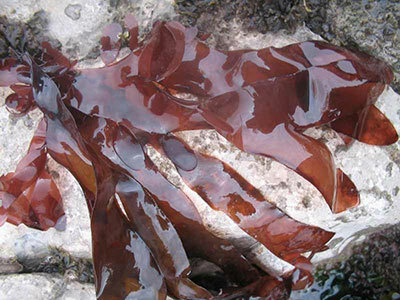 The mineral fraction of some seaweeds accounts for up to 36% of dry matter. Many of these essential minerals accumulate in seaweeds at much higher levels than in terrestrial foodstuffs. 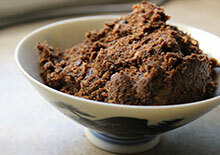 For example, there is more iron in an 8 g serving of dry Palmaria palmata than in 100 g of raw sirloin steak." 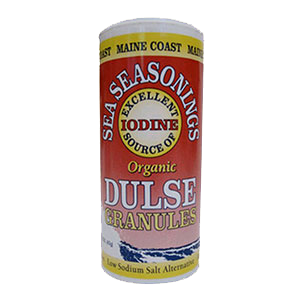 Although other seaweeds, like kelp and bladderwrack, contain higher ratios of iodine content, dulse can be a much more palatable alternative for those looking to add more iodine to the diet. 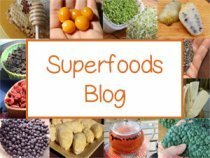 It is an often suggested variety for the natural treatment of hypothyroid issues, although the additional use of an iodine supplement is sometimes also commonly recommended. Iodine is an essential mineral for thyroid balance and important to have in the body, so you don't absorb radioactive iodine that may be present in the atmosphere. Adequate amounts of dietary iodine help to protect the body, and especially the thyroid gland, from radioactive iodine uptake. 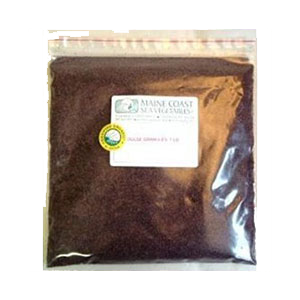 Palmaria palmata can be a natural way to supplement the diet with iodine. This may be helpful for those with hypothyroidism or an underactive thyroid gland, a condition that is becoming more and more prevalent in today's world because of low dietary iodine consumption and absorption. In addition, thyroid imbalance can occur in response to heavy metal toxicity and the uptake of certain toxins in tap water, like chlorine, fluoride and bromine, which can displace iodine in the thyroid. When discussing ways to help balance thyroid hormones and treat hypothyroidism or hyperthyroidism, there are many complex factors involved with each unique individual and one's current state of health. Often times autoimmune diseases or heavy metal toxicity is also a factor to consider in treating thyroid dysfunction. It is therefore important that you do your own research and seek the advice of a qualified thyroid specialist to help evaluate your own unique thyroid profile using the appropriate and thorough laboratory testing procedures. For more information about the thyroid gland and its possible dysfunctions you might want to read the following recommended books: "Overcoming Thyroid Disorders", by Dr. David Brownstein and "The Thyroid Solution" by Dr. Ridha Arem or "Hypothyroidism Type 2: The Epidemic" by Dr. Mark Starr. For this reason, we recommend eating raw dulse with food ferments like sauerkraut or cooking it into miso soups and tempeh dishes to increase protein content. The seaweed can additionally be used as an ingredient in homemade ferments like seed cheese, miso, tempeh or when culturing vegetables. The polysaccharide nutrients found in all seaweeds are especially activated when heated in water and released into the liquid broth. This is one of the best ways to consume them and is one of the reasons why they are traditionally served in hot liquids, such as Asian miso soups or Irish soup broths. 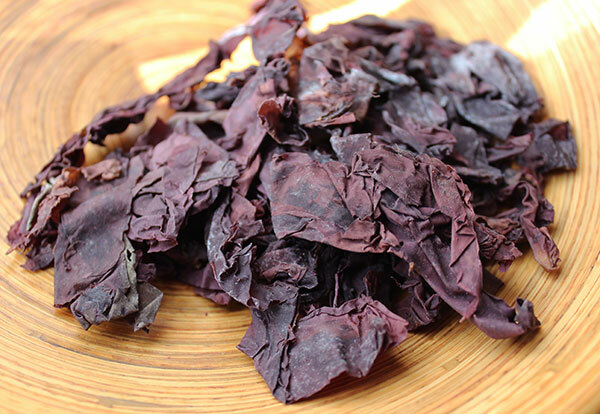 In a study published by the The Journal of Nutritional Biochemistry, it was shown that some dulse is higher in protein depending on the time of year it is collected. 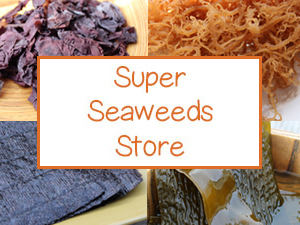 It is therefore important to purchase seaweeds coming from a reputable source that takes nutritional value into account when harvesting. 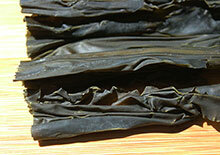 Maine Coast Sea Vegetables are one of the highest quality seaweeds available. They are tested for chemical pollutants and radioactive isotopes that are, unfortunately, sometimes present in ocean waters. 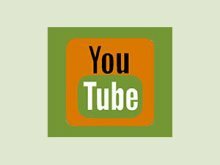 The carotenoids alpha-carotene, beta-carotene, lutein and zeaxanthin, are all present in Palmaria palmata. These are beneficial nutrients for not only protecting against harmful free radicals, but are important antioxidants for nourishing the eyes and maintaining vision. 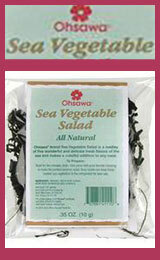 Most sea vegetables are about 30% fiber, half soluble and half insoluble. Seaweed fibers are a bit different than most plant-based foods, however, as they contain fibrous polysaccharide substances like alginic acid which additionally help to detoxify heavy metals and radioactive isotopes from the body. 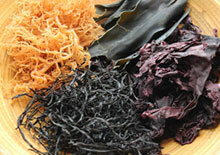 Kelp seaweed and other brown seaweed varieties are particularly abundant in alginic acid or agin, but dulse also contains this polysaccharide in adequate amounts. Because seaweed polysaccharides work to detoxify the liver, the cleansing actions they provide naturally help to encourage healthy looking skin. Many of the seaweeds help to beautify the epidermal tissue and Palmaria palmata is no exception. 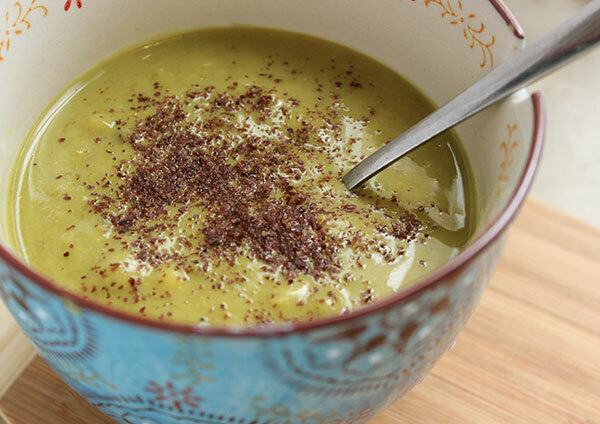 You can add ground powder to a face mask, but also eating it on a periodic basis will help to clear skin issues. The mineral quality in seaweeds, whether used externally or internally, also help to nourish, tighten and provide smooth supple skin. Many sea vegetables are commonly used in the cosmetic industry as a popular natural ingredient in skin care products for this reason. 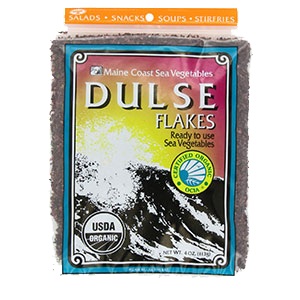 Dulse flakes make a perfect salt substitute for those on a low salt diet. Sea vegetables contain natural salts within a whole food matrix as opposed to concentrated sea salts that are relatively higher in sodium content compared to their ratio of other minerals and nutrients. 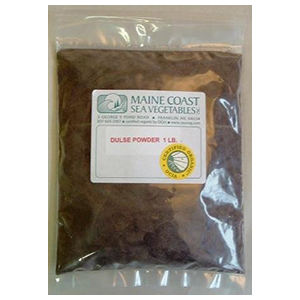 Dulse provides sodium along with the essential sodium balancing mineral potassium. Both minerals work together like calcium and magnesium to provide proper fluid balance inside and outside each of the cells. 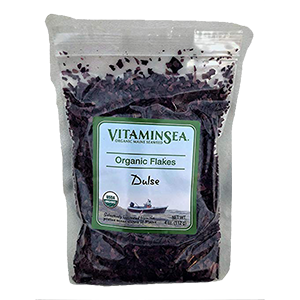 One amino acid found in dulse and other seaweeds is an unbound form of glutamic acid, a natural flavor enhancer. 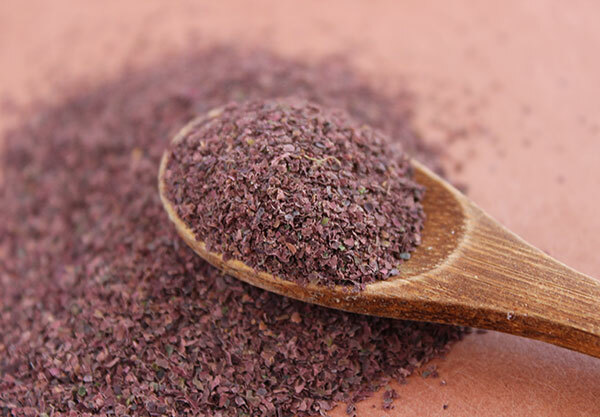 But unlike the food additive MSG (monosodium glutamate), which is the isolated salt version of glutamic acid, dulse is a much healthier whole food alternative used in much the same way, to accentuate the subtle essences of other foods used with it. Glutamic acid aids digestion and improves nervous system functions and mental capacities. It is also thought to control schizophrenia, sugar cravings and alcoholism. Palmaria palmata is not only a source of Vit. C and beta-carotene but also Vit. E, many of the B vitamins and living enzymes, including pyruvate carboxylase, which helps to convert energy from sugars and assists to prevent hypoglycemia. 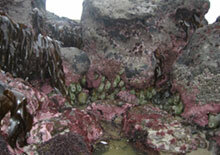 In the 2011 article published in the Journal of Lipids in Health and Disease entitled "Polyunsaturated fatty acids in various macroalgal species" it states that, "One of the most interesting observations of this study was that the highest relative concentration of PUFAs in the red seaweed Palmaria palmata was observed for eicosapentaenoic acid accounting for 59% of the total fatty acid content. EPA is a very important Omega-3 fatty acid in fish oil." PUFA's or polyunsaturated fats play an important role in regulating inflammation in the body and aid in proper brain and nervous system functioning. When it comes to purchasing your seaweeds, it is always best to choose those coming from a reputable company, whereby the sea vegetables are harvested from pristine waters and/or grown in a certified organic manner, along with thorough testing for possible pollutants. Maine Coast Sea Vegetables, Seaweed Iceland and Rising Tide Sea Vegetables are several leading companies providing high-quality seaweeds. Marine Coast Sea Vegetables harvest most of their seaweed from the northern Atlantic (Maine Coast) coastline and provide laboratory testing for heavy metals and other contaminants. 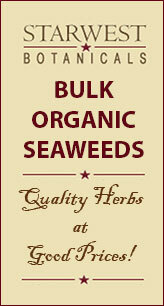 Mountain Rose Herbs also offers certified organic whole seaweeds and powders. Two other second best, but our less preferred options, would be the brands Eden Foods and Emerald Cove. 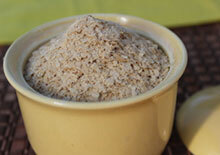 Powder - The ground fine powder makes a great salt substitute that can be sprinkled on most meals. 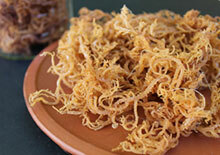 Flakes - These small little flaked pieces are one of the most popular ways to use this seaweed. 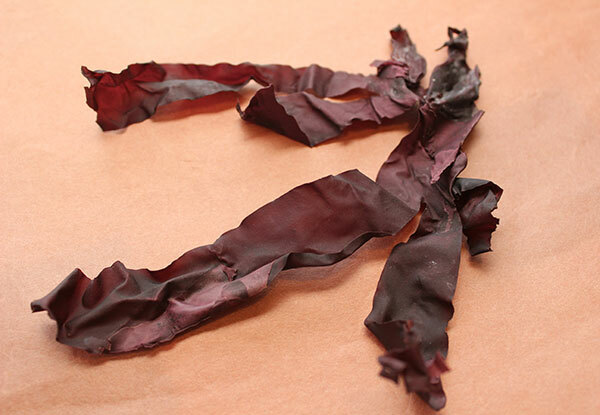 Whole Pieces - The soft chewy pieces of this red seaweed can be eaten straight, added to soups or soaked and chopped into raw meals. Fresh Seaweed - If you have access to clean ocean waters, the fresh seaweed is a delicious addition to a homemade seaweed salad. Extracts, Capsules, Tablets - Available for ease of use as a dietary liquid, encapsulated or compressed powder supplement. This is one of the most popular seaweed varieties to eat because it tastes so good with a mild smoky flavor that isn't as "fishy" tasting as other seaweeds. The dried flakes make a great salt substitute and whole pieces can be added to salads, miso soups, crock-pot stews, chowders or soaked and chopped into seaweed salads. The polysaccharide nutrients are made more bioavailable when heated in liquid and provide a thickening quality to soup broths. Small amounts, between 1/4-1/2t, can be added to food in the form of dried flakes or powder for a slightly salty taste that is lower in sodium content compared to sea salt. 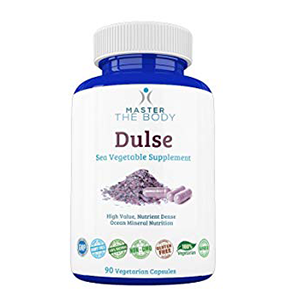 If your not into eating seaweeds as part of your diet, for supplemental purposes you can use dulse as an extract or it can be taken in capsule or tablet form for periods of time to increase dietary minerals. 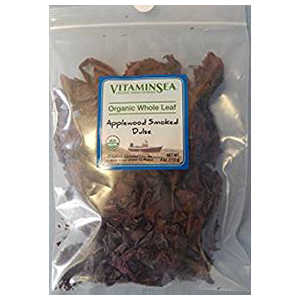 Dulse and other seaweeds are best avoided in large amounts by those with hyperthyroidism or an overactive thyroid, the opposite of a hypothyroid. Large doses over a period of time can cause iodine toxicity in some people. Avoid consumption if you have allergic reactions to iodine. Seek the advice of your healthcare provider if pregnant, nursing, have a serious medical condition or are taking prescription medications.